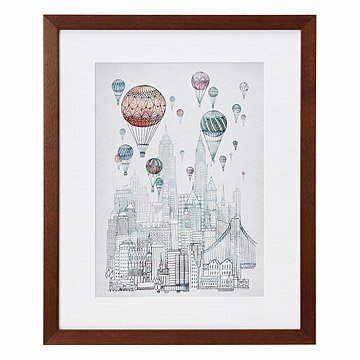 The New York cityscape comes to life with colorful balloons, evoking a nostalgic sense of wanderlust. The city that never sleeps gets a set of uplifting visitors in this painting by David Fleck. A line-drawn cityscape comes to life with the addition of colorful balloons, evoking a charming sense of nostalgic wanderlust. Designed in Scotland. Printed and framed in Portland, Oregon. Ready to hang with wire hanger. Includes care instructions and artist card.